It supports wireless HD video with zero delay (1ms) and up to 4 receivers. The transmitter accepts either HD-SDI or HDMI input, and the receiver outputs both HD-SDI and HDMI as well as USB 3.0 video and audio output. The receiver features an OLED display and joysticks for easy setup and pairing. 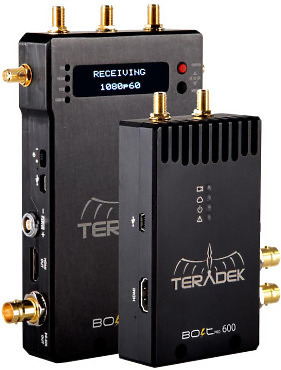 Hire the Teradek Bolt Pro 600 Set - RX & TX from Procam. Best service and rental rates for the Teradek Bolt Pro 600 Set - RX & TX and all cameras, lenses, sound, lighting and grip.